This is cow leather that has been tanned to be soft like deer leather. These are bigger, cleaner pieces with fewer flaws than real deerskin. Each hide is marked with its total square footage. 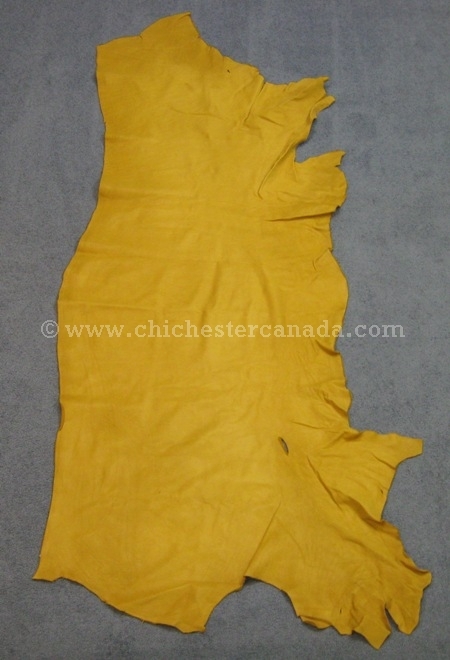 The prairie gold leather hides range in size from 22 to 26.5 sq. 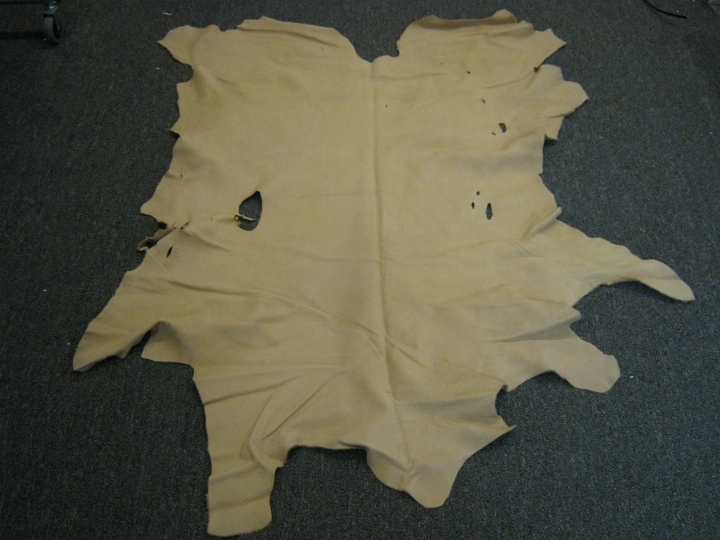 ft. We also have cream cow leather, which ranges from 13 to 24 sq. ft.
We can usually select either smaller or larger pieces according to your wishes. We will not, however, cut hides to specific dimensions. The piece of prairie gold leather that is pictured at the top of the page is 21 sq. ft. and measures 86" long, 26.75" across the top, 34.5" across the middle, 39" across the bottom, and weighs 2.96 pounds. The piece of cream leather pictured above is 13.75 sq. 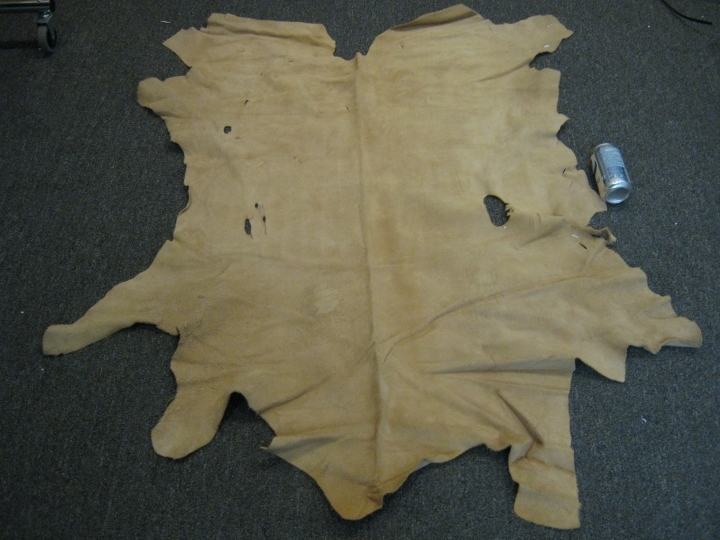 ft.
CR-1215-20-CR3 Deertanned Cow Leather:Cream (3-3.5 oz.) C$7.50 / sq. ft. C$6.50 / sq. 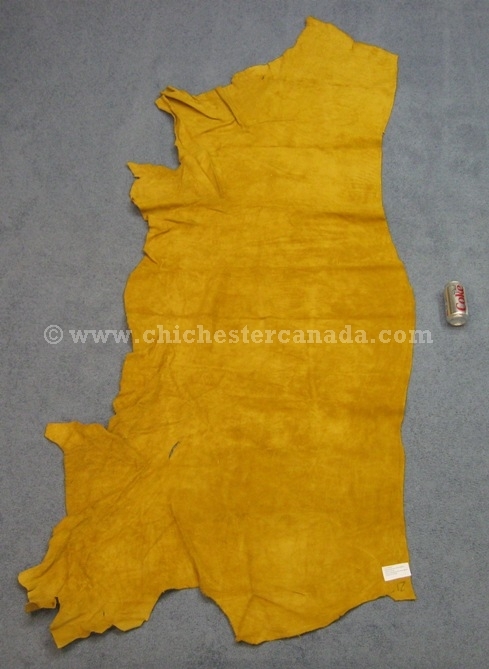 ft.
CR-1215-20-PG2 Deertanned Cow Leather:Prairie Gold (2-3 oz.) C$6.75 / sq. ft. C$5.75 / sq. ft.